Wedding invitations are such an important part of the wedding. They are one of the first, if not the first tactile part of your wedding that you and your guests will be able to see. They will set the tone for the entire event. Your invitations should capture your theme, colour palette, what type of paper materials will be used at your wedding, what typefaces will be used for your day of stationary, the overall look and feel of your wedding and of course, most importantly key details about your wedding that your guests need to know to prepare for the day. Thankfully we have the help of wedding websites these days so we don’t need to provide as much information in the invitations if we don’t want to. We sent these out via paperless post. It was a good price and it was a good way to get the word out quicker and responses back quickly. This gave us an idea of how many people to expect would be able to attend and who all we would be needing to send invitations to. They even have an option to design your own invitations if you’re like me and have some design skills. If not they have tons of beautiful designs to chose from that will surely go with your theme. This is the main part of your invitation. It should include the couple’s names and their parents names. It should include the wedding location, date and ceremony time and notify guests if there will be any celebrations following the ceremony. There are a lot of different options of how you can word your wedding invitations and looking at examples on instagram and pinterest is a great way to find the right fit for you. This is also an important part of your invitation. Guests can check off if they will be attending or cannot attend your event. 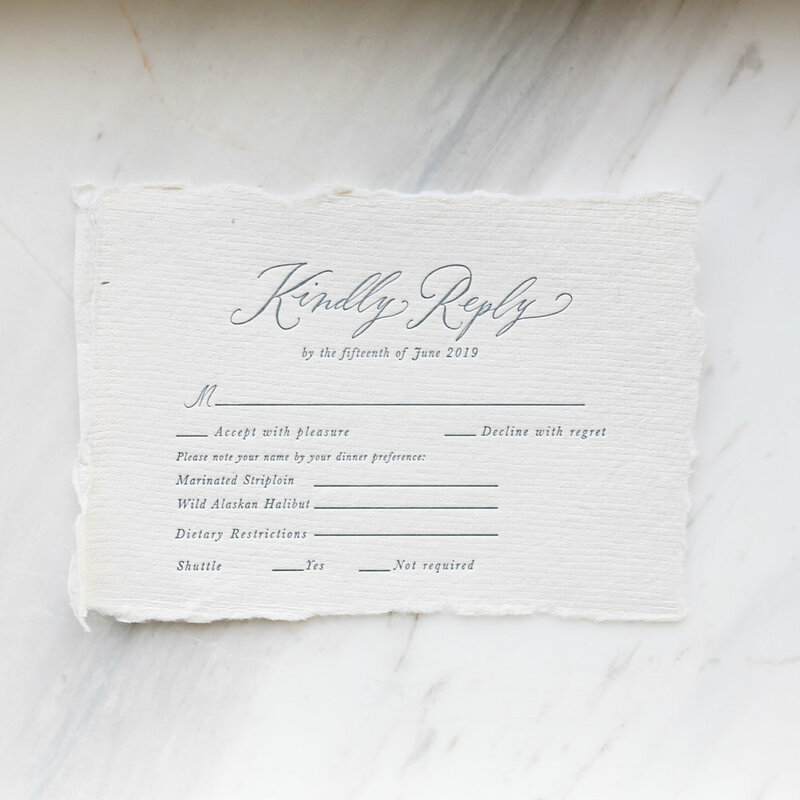 You need to give them a date they need to reply to you by (usually about 2-3 months before the wedding) You can also include meal options if you are having a plated meal and ask for any dietary restrictions your guests may have on this card. You will also want to provide an envelope, pre-stamped for your guests to send back to you with their reply. If you have guests that live in another Country you’ll need special stamps for their reply envelopes. If you don’t have access to the stamps you need you may be able to order them online, or they may just have to add a stamp themselves. Lucky for me, my mom picked up some american stamps when at their place in arizona and sent them to our Calligrapher to add to those specific envelopes. Another nice touch is to include a map of where your wedding ceremony and reception locations are in relation to the airport and hotels your guests may be staying at. We opted out of this option, we decided to spend money on other areas for the invitations and I put a map on our wedding website instead. If you have any additional information for your guests regarding, additional wedding weekend celebrations, shuttles, room blocks, wedding registry, wedding website link…etc. You can put that information on this card. We chose to email out that information to everyone and put it on our wedding website for the same reason we did for the map. Mr. Raymond and Mrs. Catherine Foot and if there were children invited we went with Mr. Raymond and Mrs. Catherine Foot and family. This was a fun process. Just kidding. This was actually kind of complicated. I would recommend you take one of your final completed invitations to the post office for them to weight it and try to fit it through the usual mail slot before purchasing your stamps. Once you know how much postage you need, buy the proper amount and place them on your invitations at home and bring them back to the post office. When mailing your invitations ask that they be hand cancelled. That just means that they will be processed by hand rather than by a machine which leaves little risk for your invitations to be damaged. Where do I begin? These were a labour of love I tell you. I think I worked on these for over a year and a half. I spent countless hours on instagram and pinterest collecting inspiration for what I wanted our invitations to look like. I wanted them to really set the tone for our wedding and be something we could frame in our home one day and display proudly. After spending countless hours collecting images I went back through to really get an idea of what the common trends were in what I liked. They pretty much all were printed on handmade paper, had silk ribbon wrapped around and had a vintage love letter like quality to them. As for the colour palette, I found one invitation that had been done with a dove grey envelope, handmade paper invite and a beautiful greyish blue ink. I was sold. That was the way I wanted to go. Being a graphic designer, I toyed with the idea of designing them myself but in the end I wanted them to be perfect and I fell in love with @HelloMaurelle’s calligraphy style and that just wasn’t something I could do on my own. She has the most romantic style of writing modern calligraphy. My brilliant wedding planner Nicole of Created Lovely events defined her style perfectly saying it looks like a vintage love letter and that was exactly the feel I wanted for our wedding invitations. We decided to go with handmade paper, I was always drawn to that look. I loved the texture and the raw edges. I felt it really elevated the overall look and feel of the invitations. It’s so nice to hold in your hands too. On it’s own it looks like a work of art, which honestly it kind of is. I plan to frame blank sheets of it in our home one day on a large white matte within a thin gold frame. As for the envelopes I had seen a couple of Maurelle’s other projects she had done and one really caught my eye. It had this stunning dove grey cotton envelopes with the most beautifully written addresses which she had done in Calligraphy. I went back and forth on whether we should have the writing in white or a slightly darker shade of grey for a few months (I’m totally serious) and finally landed on the tone on tone grey look. I just loved how subtle it was. It felt unique too. When it actually came down to writing the names Maurelle sent me some pictures to see if the ink shade was right. I got pretty nervous because in the pictures the ink looked quite dark and I really wanted it to be a subtle difference in shade so she sweetly stopped by my house on her way to a family event that was taking place near by so I could see it in person. We decided to go a few shades lighter and I am so glad we did. They turned out exactly the way I wanted them to. I love looking at them super close up because in some areas the ink is lighter and other areas it darkens a little bit. It’s just so pretty. We actually also went back and forth on a few different versions of calligraphy too. The first set was a little more rounded and shorter but I really wanted the letters to be slightly more elongated (tall) with more flourishes on the capital letters. She did the most amazing job. I hope one day I can have one ounce of her talent. As for the stamps we found some amazing vintage stamps on etsy. They can get quite pricy so we decided to only purchase a few for photos. The stamps we found were actually of the location where we got engaged so they seemed perfect. I had actually planned on using some of them on our parents envelopes but in the end our postage got more expensive and it just wasn’t going to work. Finally, the wax seal closure. I love wax seals, Nick actually seals letters to me with them all the time. He bought me our own personalized one for my birthday last year and we sent it to Maurelle to use to seal our invitations. We bought it from Artisaire. Again I hummed and hawed over which design to get for ages and when it came to the wedding invitations I hummed and hawed some more over whether we should do white wax seals or gold ones. We ended up landing on with. I just loved how the softened the grey envelopes. Last of all we got our return address made into a stamp through B.C. Stamps. They turn around stamps in 24 hours which is incredible. All you need to do is give them a pdf, ai or jpg file. We were so lucky that our super talented calligrapher gave us our invitation logo of our names to use for the top of the return. Because it was stamp ink we didn’t have as many options so I chose to go with white so it would be the most subtle. You can also getting this printed on all of your envelopes or letter pressed in, I just didn’t think of it at the time.